I'm sure you've heard the phrase, "The way to a man's heart is through his stomach." Well this is very true with my husband. But I also think that making things for someone shows that you really care because you're taking time to do something for someone else. My husband needed some new button-down shirts for work, so I decided that I would make some for him. I had three different shirting fabrics and a pattern in my stash, I just needed to sit down and do it! So I made a vow that I was going to start and finish all three of these shirts before I worked on any other project. (Haha, how many of us say that?!) I used McCall #6044 and three different cotton shirtings I bought from Fabric Mart a few years ago. The first shirt I cut out in size large because that's "what the pattern told me to do." I knew that when I make clothing for myself I never make my ready-to-wear size, so I was expecting the same thing here. When my husband tried the shirt on, I ended up having to take it in a whole size! So I stopped working on that shirt and cut out the next shirt in size medium. There were just a few changes I made to the pattern. I cut out the collar in size large, because he has a larger neck circumference. On ready-to-wear shirts, he has to leave the button at the top open (when wearing a tie.) I also had to make the sleeves 1 1/4" shorter and the hem 2" shorter. The pattern was quite simple as far as details go. I added a yoke to the back of the shirt to help make it more like a ready-to-wear shirt. I also added top-stitching to the shoulder seams, and armhole. I had a hard time finding a thread that matched the background color, so I selected a deep navy thread. 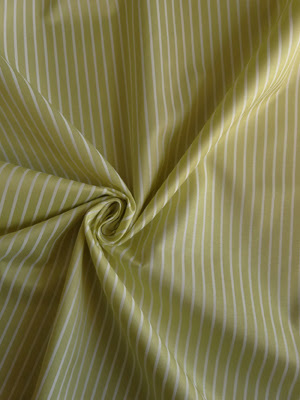 It matches some of the pin-striping in the fabric. I used Pellon Shir-Tailor Fusible Interfacing for the collar and cuffs. I used a lighter weight interfacing on the button yoke because the Shir-Tailor made it too stiff. Overall, I really enjoyed making these shirts! They were fairly easy and I whipped up two in one weekend. I don't think we're going to be buying button-down shirts anymore. I will be shopping for fabric instead! We have a nice selection of cotton shirting right now. Here are a few shirting picks I think would be great for a men's shirt. What will you be making for your significant other? Love the shirting in the modeled shirt! The dotted pinstripes are lovely. And you've now made me feel guilty enough to want to make a muslin up for the man! Button down normally refers to the collar type which has buttonholes at the tips and buttons on the shirt front just under the neckline that corrals the tie. Did you opt not to put on the buttons and buttonholes? From experience, they can be a real pain in the patoot to get exact. RTW factories have such wonderful specialized machines. But nice job. Sewing for appreciative menfolk can be very gratifying. I put buttons and buttonholes on the front and the sleeve cuffs-- his tie is just covering them up in the picture. My sewing machine is a life-saver when it comes to buttonholes. I have a Bernina which I am able to program the size of each buttonhole, therefore each buttonhole is the same size. I make my husband's dress shirts all the time. He has a large chest and arms, but is trim in the middle, so buying shirts to fit his neck/chest and arms always gives him a ton of extra fabric around the waist. Believe it or not, the most difficulty I have is finding cool buttons that match, but don't cost more than the shirting fabric. I now use WAWAK for a lot of my sewing and tailoring supplies. I make dress shirts for my son as well, but he doesn't need as many as my DH. I find ties are very economical to make, and simple at that. I yard of fabric will make 2 ties...one for each of the men in my life. 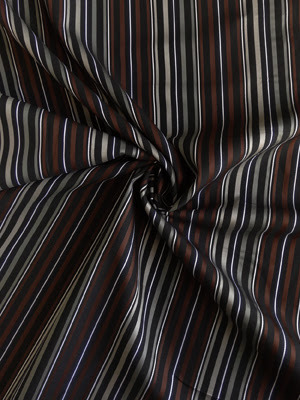 Its more difficult to purchase tie fabric on line for me, however, because I like to see the drape and heft of the fabric before I purchase it. I have made ties out of cotton before, and they turned out fine. One just gets a better drape and wear from a silk tie. It's so nice to see that there are others making shirts for their husbands! I was worried that my husband would be fussy about "handmade" items, but was happy about the response! I've made a few shirts for myself. In think the "sewing Men's products" have been totally under-used. Good fit, I really like this shirt and the color is perfect for my lifestyle i would like to buy this from mens shirts store. Great job! Don't show this to my husband please otherwise he will be putting in his order to me lol. I haven't tried a shirt yet, but I did make him a vest for his birthday a few months ago. Maybe he will get a shirt for Christmas. Great job and nice color combo!